Over Martin Luther King Jr. weekend, a few friends and I made the trek over to Tempe, Arizona where a friend’s aunt lives. With a long weekend, it would be fun to just get out of San Diego and see something different. Some may think it’s crazy that we went from San Diego to Arizona because San Diego’s a remarkable city in itself, but to be honest, seeing it everyday makes leaving for just a weekend something that must almost be done. Driving through the mountains and the desert was something I could enjoy. I saw beauty in the rock formations and the pillaring mountains in the distance. To some extent, it reminded me of home back in Oregon, just a lot drier and a lot warmer (for this season at least). Looking at them I just thought more about God’s amazing beauty, that He created all these different places, different environments, containing various plant and animal life. 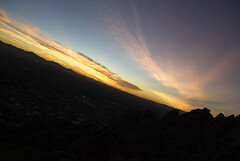 When we arrived to the house in Tempe, we changed our clothes, and my friend’s aunt quickly sped us over to a mountain that we would hike and see the sunset. We didn’t have time to make it to the top, but we still made it to a portion of the mountain with an outstanding view of the sunset. Just like any other location, the sunset was as beautiful as ever, another slice of the beauty that God showed me over the trip. As we were sitting around the house recovering from our drive and then our hike, one of my friends played a song that used to be on my original “February” playlist, “Beautiful” by Shawn McDonald. I hadn’t heard this song in a while, but it could not have come back up at a better time. This song is about insignificant man in comparison to our grand God. This guy is looking at all the beauty around him, the sun the stars, and asks the question “What am I?” God created all these beautiful and marvelous things, things way bigger than us, as well as ourselves. We feel so incomparable to the mountains, the sunsets, the galaxies, and yet He died for us that we might live. Might, His death does not guarantee us life. It’s up to us to accept it or not. He died for us to give us the option of a better life, His pain, His suffering, for an alternative option for our lives. Our time in Arizona came to a glorious end when we decided to wake up and hike to the top of that mountain to see the sunrise before we left. Getting college students up at 5:30 in the morning on a day off of classes is a difficult task, but we got ourselves to do it. We packed up our things, ate a bagel, and went on our way over the Camelback Mountain. We got to the mountain around 6:30 and began to the top through the darkness with our night vision that hardly kicked in. As we climbed up the familiar and easy part of the trail with steps and railings, it gradually became lighter, and we could see more. 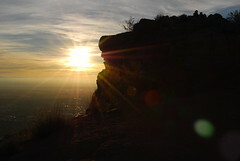 We reached one viewpoint but knew we knew we could not stop because we needed to make it to the top before the sun rose. The hike became more and more difficult as we raced up the mountain, and I didn’t have the energy I had a couple days before and didn’t really know where I was going. I wasn’t jumping from rock to rock and hopping from here to there. As I became more tired, I started asking myself where my energy had gone. Soon enough, I realized I was still waking up, I had maybe 5 hours of sleep, and I hadn’t eaten a full meal since 4pm the day before (excluding the ice cream cookie sandwich the night before and bagel that morning). 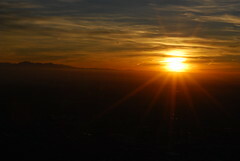 Despite it all, I knew I had to keep climbing to make it to the top for the sunrise. I desperately wanted to see the beauty God had in store. Looking back at this past weekend, I can’t help but smile thinking about all the beauty God showed me. The climb up that mountain reminds me so much of an attitude towards God. There are numerous metaphors for climbing mountains, overcoming struggles, accomplishing a great task, etc; but for me, climbing this mountain is how I want to pursue the Father. Our relationship with God involves coming out of the darkness and into the light. That transition requires obstacles, but they are most beneficial alongside perseverance. Though life may bring struggles, I will keep my focus on the Father and know that He has sometime glorious in the end. If I don’t continue to go, I might delay the process or possibly even miss it. Wow Sean, your pictures are beautiful and your writing is truly inspirational. Thank you for sharing your experience… I'm so blessed to see how the Lord continues to work in your life and use you to touch others 🙂 You are a remarkable young man!